Even for a healthy schizophrenic it's pretty easy to make music because the only possible problems you have to deal with are an inner dialogue or a compromise you have to make with your very own personal goals. Until now this has always been the comfortable way of making music for me. But since I am looking for new boundaries to break and new challenges as a musician, I invited our guitar player Schidde to be involved in finishing the new songs. Schidde is not even a 'healthy' schizophrenic so as far as having my big challenge I succeeded already. 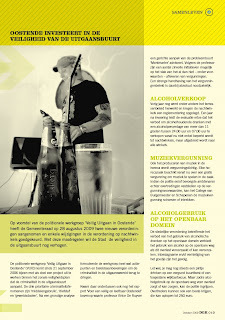 As mentioned in the previous blog the adventure started last friday when Schidde came by for a first jam session in the Diskonnekted home studio: the 'Cyberflesh Lab'. I have footage of the afternoon and will post that later when starting a series of 'Behind the scenes' videos. We recorded straight into Cubase using Guitar Rig as our virtual amp. It still is a very cool toy but the software definitely lacks a real 'rock 'n roll' vibe. However: the beers and cigarettes made the balance right. OMFG. When working on the recorded guitar parts this week I was happily surprised by the result of the first jam session. Yesterday we just decided to work differently and headed for our rehearsal room above the Twilight (our favorite rock pub in the city). There we are able to play loud and to use Schidde's amp, a tube driven Switchblade by Hughes & Kettner that already makes a hell of noise at volume setting 0.5. So I really don't want to know how volume setting 10 sounds like. Anyway, the rock 'n roll vibe of the rehearsal room was inspiring and Schidde came up with some very cool and aggressive guitar riffs. Really the kind I was looking for. Not having Cubase installed on my iBook I used the by default installed GarageBand by Apple and I was happy to discover a very easy to use recording/studio interface. Simple but solid. 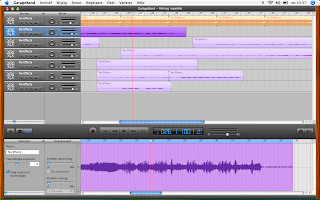 Thanks to GarageBand I was able to record the guitar parts and now I am able to work on the demos in the Cyberflesh Lab. I am thrilled and excited. 10 years in the making: the final version of 'The Parting' will be an explosive result. Stay tuned! It's been a hell of a busy weekend. It started friday afternoon with recording guitar parts for 'The Parting'. I will report about that in another blog someday soon. Yesterday I finished yet another remix. 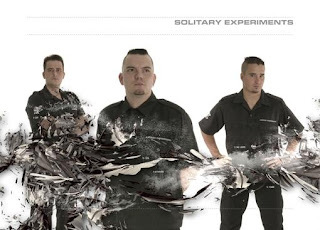 Solitary Experiments will release a new album and I am happy Diskonnekted was invited to remix one of the new tracks. I fastened the original 118 bpm up to 125 bpm and pimped the track with atmospheric dance elements. Put on your dance shoes and prepare yourselves for the clubs.